Planning for a catering event may seem like a daunting task at first glance. With all the necessary things that you might find the need to accomplish as soon as possible, it is easy to dismiss the assumption that organizing catering events are an extremely difficult event to plan. However, this is not entirely true since there are so many ways on how to lessen the difficulty of such kind of event and one of those ways is the use of a catering event checklist templates that will surely get all bases covered when it comes to organizing a catering event. In this article, we will, indeed, get all of your bases covered by providing you some of the best catering event checklists that will surely help you out in keeping track of the all the necessary matters when it comes to organizing a catering event. No matter how much you would carefully plan every single thing in your upcoming catering event, there is always that possibility that things will get to the wrong path. In order to counter all those unfortunate circumstances, it is best for you to have a catering checklist that will keep you reminded of every single matter that you need to deal with. In organizing a catering event, one of the matters that you will really have to attend to is the deliveries of all the supplies that you need in order to make your event successful. 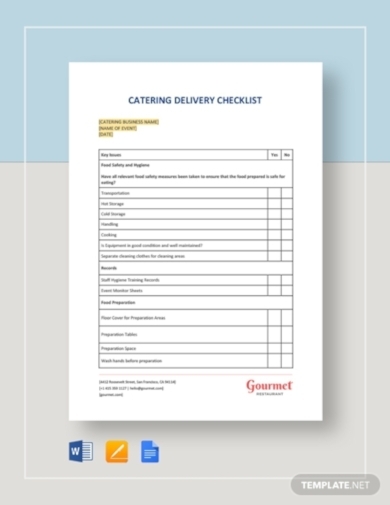 We provide you with this catering delivery checklist that can keep you posted of all the things that you need to be delivered to you before your event. This template is easy to download, customize, and print so you wouldn’t have to worry about that anymore. 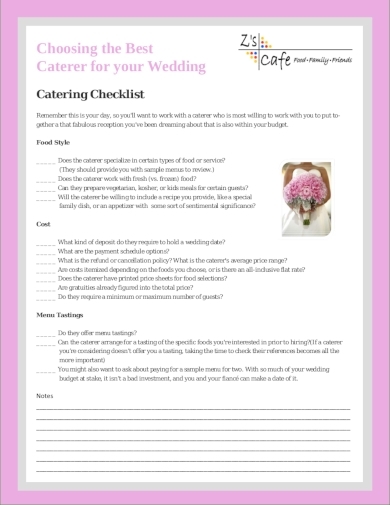 Are you looking for a catering checklist that will make sure that you are kept posted of all the significant information needed when organizing one? Lucky for you because we provide you this dining catering checklist that will make sure you will have everything covered right from determining the type of catering event, the style of the catering event right down to the actual setup of the venue on the day of the catering event. 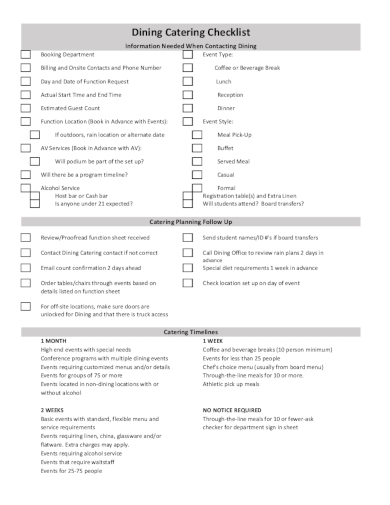 This checklist features additional items that allow you to conduct a thorough follow-up of the things that you still need to do in order to ensure the success of the event. And to make this checklist even more excellent, it also features a catering timeline that you can constantly refer to as you follow the checklist that comes with it. By providing healthy options in your catering business, you will be able to cater to clients and their guests who are health conscious or who have any food restrictions in terms of diet, ethnicity, or religion. 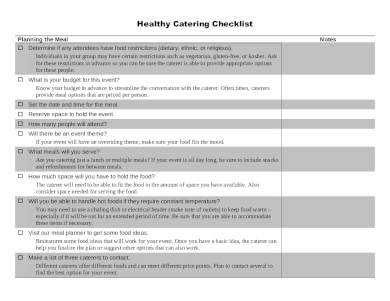 With the use of this healthy catering event checklist, you will be able to make sure that you take into consideration your clients’ and their guests’ food restrictions. Your client can also comfortably discuss such restrictions with you because they know that your catering services provide various appropriate options for these people. 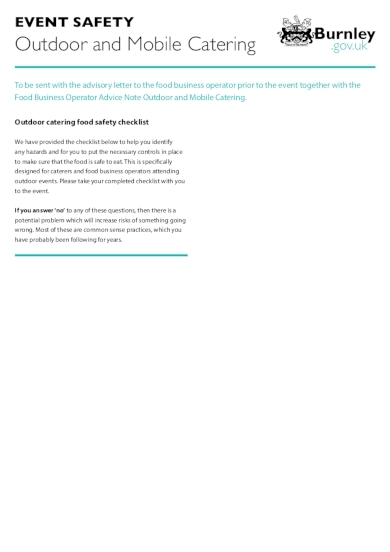 This mobile catering event checklist we have provided will help you in identifying and analyzing all the possible hazards as you conduct your mobile catering business. This template can also help you in making sure that you can put all the necessary controls in place that will ensure the safety of the food that you will serve for the consumption of your guests. 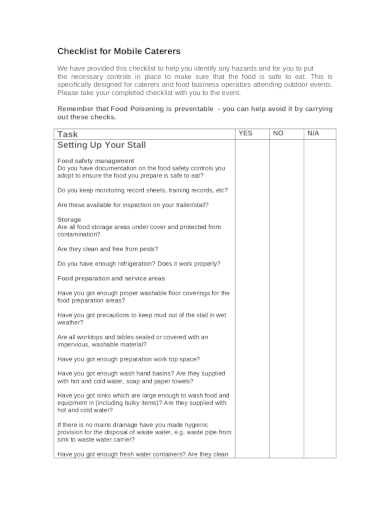 And since this template is specifically designed for caterers or food catering business operators like you who runs a mobile catering business, this checklist will really be of great help in mitigating all the possible risks and among that is food poisoning. Always know that food poisoning is something that is preventable and through this checklist, you will be able to effectively mitigate this. All the possible risks and hazards when it comes to running an outdoor and mobile catering business can be avoided as long as you will effectively create a plan on how you can mitigate it. One way of ensuring that you will be able to avoid such risks is by making use of a checklist, such as this checklist example provided, that allows you to easily and constantly check whether you are still on the right track of things or not. It is through this kind of checklist that you will be able to ensure that food safety is properly and effectively managed and observed and that safe food practices during the event will be properly executed. There are four types of corporate social responsibility and one of it includes direct philanthropic giving that include initiatives related to donating time, money, or any types of resources to chosen charities and organizations. If you own a restaurant business or any dining establishment, one of the best initiatives you can give is to provide a nonprofit catering event for a worthy cause such those who are stricken by a natural calamity. 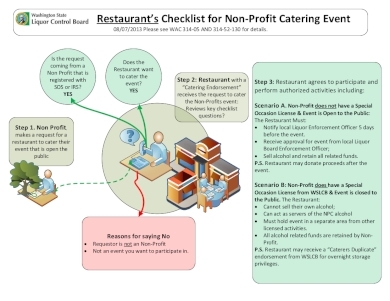 Upon doing so, make sure that you will make use of this nonprofit catering event checklist that will ensure you will get all bases covered since organizing a nonprofit catering event is different from what you usually do if you are doing it for a client. Do you have a hard time providing catering services for weddings despite the number of years that you have already been doing it? You obviously lack the guidance of a wedding catering checklist. But worry no more because we have it already prepared here in this article for you. Through this catering event checklist, you will be able to effectively target all the major matter that you need to deal with when providing catering services for weddings such as the food style, logistics, staffing, total costs, and wedding menu tastings.